Beyond the issues, here are questions for candidates seeking to be the next Arizona Governor to think about and respond concerning cities and urban issues. We hear a lot about borders. Or the economy. But something that’s forgotten in the conversations for these elections is that Arizona is largely urban. (OK, suburban.) 2/3 of Arizona’s population lives in the Phoenix metropolitan area. If you include Tucson, that’s 4/5 of the statewide population. We are a state of cities. What is the role of state government in advancing Arizona’s cities? Eleven candidates are seeking to succeed Arizona Governor Jan Brewer. The list, along with campaign websites and Twitter names, is at the bottom of this post. 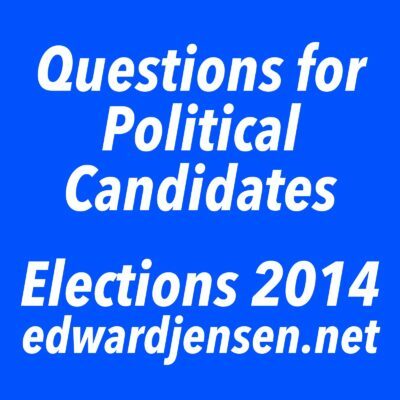 I invite readers to submit their own questions in the comments and I also invite the gubernatorial candidates to reply with their answers. What is the role of the Governor’s Office and state government in making Arizona’s cities competitive in the 21st century global marketplace? What is the role of the Governor’s Office and state government in making vibrant, diverse, and strong urban environments? The Arizona Department of Transportation is in the planning stages to build passenger rail between Phoenix and Tucson, this state’s two largest metropolitan areas and the core of the Sun Corridor. How will you make this happen during your tenure as Governor? What are your views on the proposed Interstate 11 highway between far west Phoenix and Las Vegas, Nevada? Should it be built? If not, what alternatives should be explored? A study came out in the past couple months saying that at the end of this century, the average summer temperature in Phoenix will rise 10º F (5.6º C). What are your plans to address climate change in Arizona? Should a desert state support two large and generally suburban metropolitan areas? How will you protect our deserts, some of this planet’s most biologically diverse environments, from further exurban sprawl? How will you help strengthen Arizona’s state universities and community colleges to help educate the next generation of citizens, workers, and leaders? We are all too quick to criticize our public schools. What is working in our public schools? How will you build on these successes to improve our schools, especially in our central cities? The Phoenix metropolitan area is plagued by frequent air quality problems. What are your plans to help Phoenix improve its air quality? How will you work with Arizona’s congressional delegation to continue to bring back Arizona’s share of Federal funds for infrastructure improvements and other projects? Arizona has been in the harsh national and international spotlight in the past few years for passing divisive and discriminatory legislation, like SB 1070 in 2010 and, most recently, SB 1062. How will you work with your legislative colleagues to ensure that damaging and divisive legislation is not passed? Formed in 2010, the Arizona Commerce Authority (ACA) consolidated statewide economic development mechanisms into a public-private body. Evaluate the ACA. If its mission or work should be changed, what changes would you make? How do you intend to govern: with ideological rigidity and purity or by seeking consensus and compromise? What is the last book you have read on cities or urban issues?